Response: This study was inspired by my previous findings of higher originality and creative achievement among adults with ADHD, as well as my personal observations of individuals with ADHD choosing non-traditional approaches to problem solving. College students with ADHD sometimes ignore task instructions and examples, and while this may lead to errors, it may also lead to extraordinarily unique answers and solutions. I was curious as to whether this tendency of ADHD individuals to think in an unconventional and expansive manner might lead to resistance to conformity during creative tasks. In the present study, college students with ADHD were less likely to copy experimenter-provided task examples, compared to non-ADHD peers, on a product label invention task. ADHD participants were also less likely to create imaginary fruits that resembled typical Earth fruit, compared to non-ADHD participants. Students with ADHD were less likely to conform to pre-existing prototypes of fruit and therefore invented more original creations. Response: Many Western musicians have difficulty improvising, despite having extensive training and experience. These musicians learn about and use similar musical structures in their playing (like chords, scales, rhythmic patterns, etc.) as experienced improvisers, but they may know about them in different ways. In other words, different musicians have different ways of knowing and learning about similar musical structures. To understand which ways of knowing facilitate the ability to improvise contributes to an understanding of how people are able to use knowledge creatively. 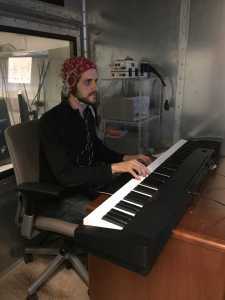 Western music provides an important opportunity to compare these different ways of knowing because in other improvisatory domains of behavior (like speaking), it is difficult to find people who know how to do it but cannot improvise with it (e.g., if you know a language, you can very likely improvise with that language). In order to advance our understanding of these improvisatory ways of knowing, we compared musicians with varying degrees of improvisation experience in a task that tested how they categorized musical chords. In Western music, different chords are theorized to have similar “functions.” For example, on a guitar, there are different ways to play a C chord, and you could often substitute one for the other. You might even play another chord in place of the C chord and have it sound similar, or lead to a similar subsequent harmony. Improvisers often use notation that specifies classes of chords rather than specific realizations (versions) of a chord whereas those who do not typically improvise use notation that specifies the full realization of the chord. By analogy, one chef might use a recipe that calls for “citrus” (in music, a class of musical chord) while another chef’s recipe might specifically call for “lemon” (in music, a specific realization of a functional class of chords). We tested whether improvisers categorize similar-functioning harmonies as more similar to each other than different-functioning harmonies, and compared how less experienced improvisers categorize the same harmonies. Our task required the musicians to listen to a series of repeating harmonies (the “standard” stimuli) and pick out occasional chords that were different in any way (the “deviant” stimuli). Some deviant stimuli were different versions of the standard chord (like limes in place of lemons) and some deviant stimuli were chords with different musical functions (like bananas instead of lemons). The more experienced improvisers were better at detecting the function deviants than the exemplar deviants whereas the less experienced improvisers showed little difference in their ability to detect the two types of deviants. In other words, because improvisers categorize the different versions of the same chord as similar, they have a relatively harder time picking out the similarly functioning harmonies. This was measured using behavioral data, and electroencephalography (EEG), which can be used to provide a neural measure of how different stimuli are perceived to be from each other. Response: In studio-based courses (e.g., design, architecture, art), students have a large project due at the end of the semester that requires creativity and attention to detail. Anecdotally, they will work long hours without sleep to finish the project. The problem is that cutting back on sleep may actually be impeding their ability to execute the project successfully. We used wristband actigraphy (a device that detects movement and light) to monitor sleep for one week in 28 interior design students—many of whom had a final project due. At the beginning and end of the week, the participants completed tests of attention and creativity. We found that students slept less than contemporary recommendations (7 to 9 hours; Associated Professional Sleep Societies) on approximately half of the nights, and shorter sleep was associated with declining attention and creativity scores across the week. The more thought provoking result was that many individuals showed inter-night variability in how long they slept (e.g., going from 4 hours to 11 hours to 5 hours to 8 hours, etc.). Inter-night variability in sleep duration was an even stronger predictor than total sleep time in how creativity scores changed across the week. Answer: We found that being in a tidy environment led people toward doing what’s expected of them or what’s considered the right thing to do — so, for instance, people in a tidy room donated more money to charity and chose healthy over unhealthy snacks. Being in a messy room, though, made people more creative.